For those who are in the know, electronic devices tend to emit extremely small amounts of electromagnetic energy whenever they are turned on, and Concepter has decided to harness the power of such electromagnetic energy to power exciting and innovative products. This is the first product of theirs that will boast of Lune technology, being an intelligent iPhone case. Known as the Lunecase, it will not make use of any batteries, or require a connection to the phone, as all that the user will need to do is to snap the case on their iPhone 5/5s/5c, and it will work directly from the spot. The Lunecase itself is smart enough to know and identify just when users receive an SMS message or a phone call even before it is displayed on the iPhone’s screen. 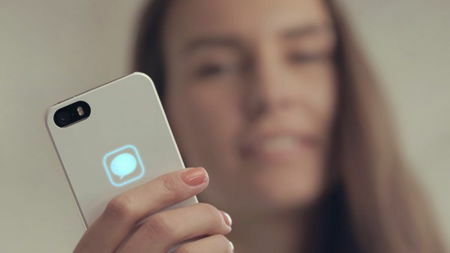 Apart from that, the Lunecase will also identify the kind of notification, being able to tell the difference between it being an incoming call or a text message, all the while showing off a visual notification on the back of the phone thanks to the presence of the LEDs that are powered by the free energy that is emitted by the device. It must be noted that the Lunecase was specially created not only to be smart, but also to be protective and sleek in its function. Made out of durable materials which will protect the phone, the case is thin and will contour according to the curves of the iPhone to perfection. At this point in time, the Lunecase has yet to enter production considering it is a crowdfunding project. You can help see it being realized, however, as at this point in time, pledges will start at $30 for super early bird supporters where they will receive a black Lunecase for iPhone 5/5S or 5c at the time of launch. Those who drop $39 can choose from either a black or white Lunecase for iPhone 5/5S and an engraved Lunecase with personalized engraving is also available for $99.